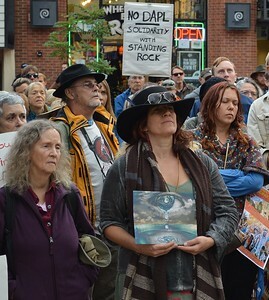 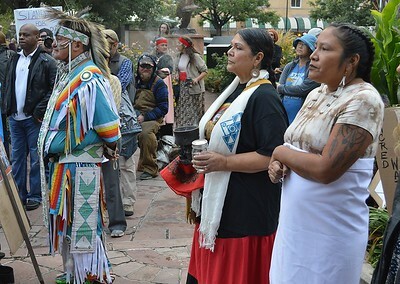 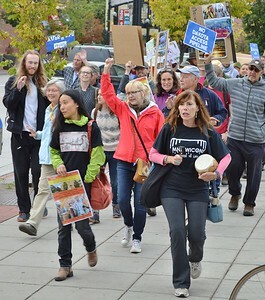 Native Americans and supporters rallied at the County Courthouse in Boulder Colorado then marched through downtown, to show support for protests against the proposed Dakota Access Pipeline that crosses the Standing Rock reservation in North Dakota. 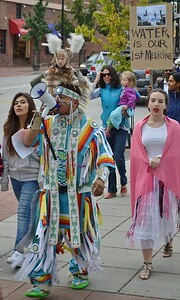 Native American man in traditional dress speaking through a bullhorn, leads protest march against Dakota pipeline. 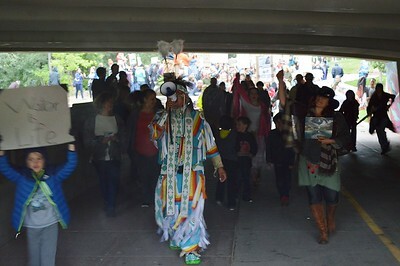 Native American man in traditional dress, speaks through a bullhorn leads marchers through a tuunnel at Dakota pipeline protest. 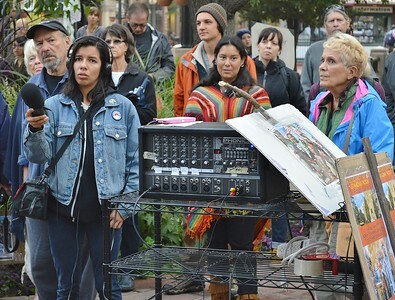 Native Americans listening to speaker at Dakota pipeline protest. 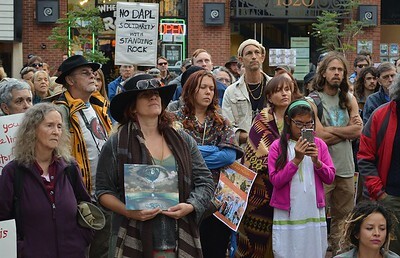 Group of demonstrators listen to speaker at protest against Dakota pipeline. 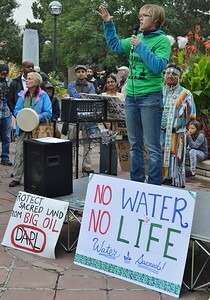 Young woman gestures while speaking at protest against Dakota pipeline. 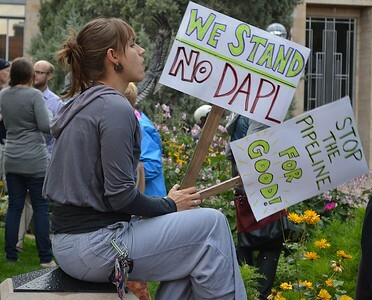 Young woman holding 2 signs, listens to speaker at dakota pipeline protest. 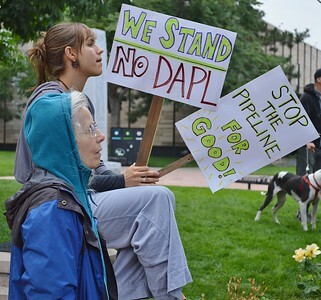 Young woman holding 2 signs, listens to speaker at Dakota pipeline protest, next to her, another, older woman. 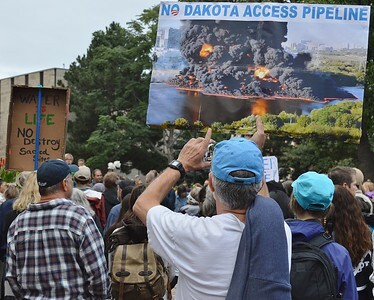 Man at Dakota pipeline protest holds sign above head picturing large oil fire in a river. 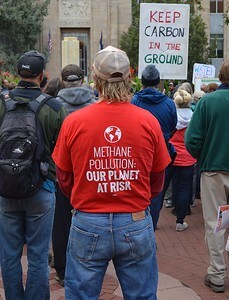 Man wearing shirt about methane pollution listens to speaker at protest against Dakota pipeline. 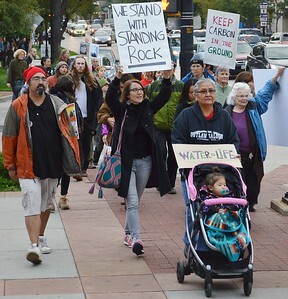 Group of protester, some carrying sign, march against Dakota pipeline. 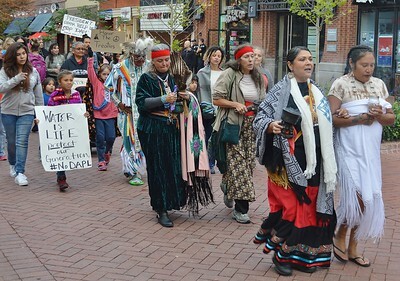 Native American man in traditional dress marches in protest against Dakota pipeline. 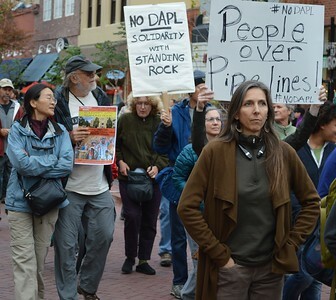 Protesters march against Dakota pipeline, some carrying signs, one with fist raised in the air, another banging a drum. 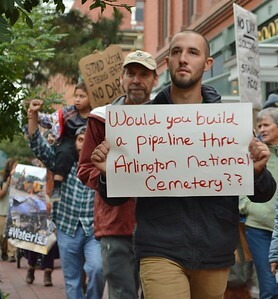 Man holding sign while marching in Dakota pipeline protest, sign refers to Arlington National Cemetery. 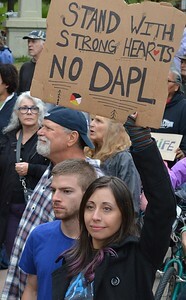 Young woman marching with sign in Dakota pipeline protest carries sign depicting native Americans. 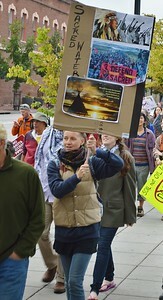 Young woman holding sign above her headopposing Dakota pipeline, other marching behind her. 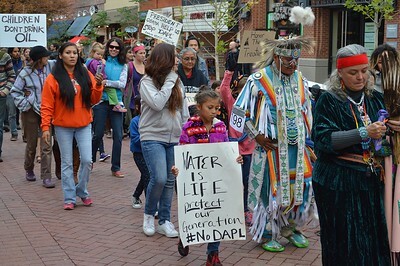 Older woman pushing young child in stroller in march against Dakota pipeline, other protesters with signs behind her. 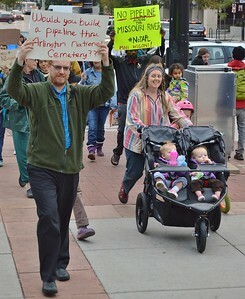 Woman pushing young children in double stroller in march against Dakota pipeline, other protesters with signs behind her. 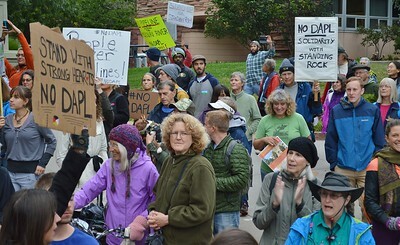 Large group of protesters, some with signs, in march against Dakota pipeline. 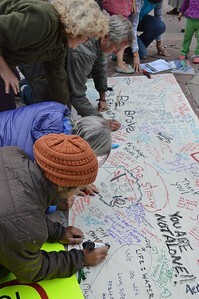 Group of women kneeling to sign large poster in support of Native Americans and others protesting piplne in North Dakota. 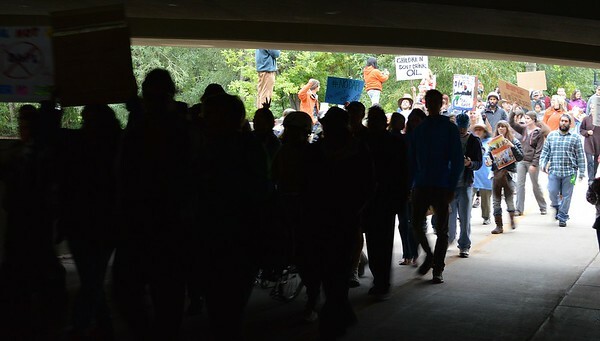 Dakota pipeline opponents march through a tunnel, some in the dark, other in the background in bright light. 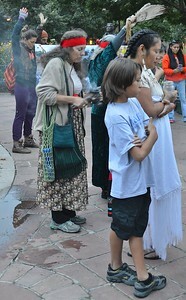 Native American woman and others bowing in prayer at Dakota pipeline protest, one woman in background raises her hands in the air. 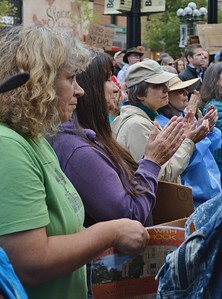 Group of women applaud speaker at Dakota pipeline protest. 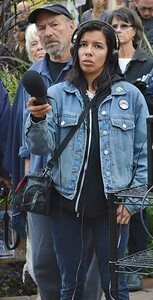 Young women holding out microphone to record speaker at Dakota pipeline protest.